Lung volume increases by as much as 15 percent during exercise. To meet the metabolic demands of your body during exertion, your breathing becomes deeper and more rapid, delivering more oxygen to your bloodstream to meet the increased needs of your heart and muscle cells. A byproduct of respiration, carbon dioxide, is released during exhale. Your lungs are protected by your ribs, a rigid structure that cannot expand beyond certain limits. Measured by a spirometer, tidal volume refers to the amount of air an individual normally inhales with each breath. At rest, the tidal volume is about 600 milliliters in males and 500 milliliters in females. The largest potential tidal volume is called the vital capacity. This is defined as the amount of air an individual can exhale after making a maximal inhalation. The normal vital capacity is 4.8 liters in males and 3.2 liters in females. However, even after maximal exhalation, some air must remain in the lungs for inflation. This is known as residual volume, about 1 to 1.2 liters. During exercise, a variety of changes occur. Cells in the heart and active muscles break down increased amounts of glucose and fatty acids to yield energy. These complex reactions produce carbon dioxide as a waste product. Increased levels of carbon dioxide stimulate parts of the brainstem to increase the rate of breathing, which serves to eliminate waste carbon dioxide. Increased breathing also has the effect of keeping the blood fully oxygenated -- an essential process that maintains cellular respiration in active tissues. Joint activity also promotes respiration. As joints in your body move during exercise, nerve endings in active joints act on your brain to stimulate additional breathing. The psychological effect of anticipated exercise also increases your breathing rate. As your respiratory rate increases, so does your tidal volume, which goes from the normal half liter per breath toward your vital capacity -- the maximum volume of air which can be exhaled or inspired during either a forced or a slow maneuver, according to the BrianMac website. Maximum volume is seldom reached, but is generally about 50 percent of the vital capacity per breath. A normal adult at rest breathes about 7.5 liters of oxygen every minute. During strenuous exercise, the amount increases to 120 liters per minute. Exercise has numerous benefits for the respiratory system. Increasing the body's respiratory capacity improves the efficiency of the system. This is especially beneficial when individuals face respiratory infections such as pneumonia. 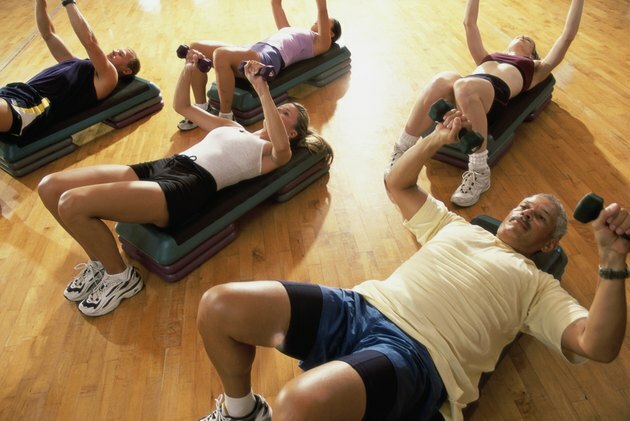 Exercise is also beneficial in managing diseases such as emphysema. While individuals with these conditions should consult their doctors before beginning an exercise regimen, they often benefit from mild exercises, such as walking for five to 15 minutes three or four times a day.